On the Nebraska fish and fishing “front”, I have several things I want folks to know about right now. So, in no particular order. . . .
NORTH PLATTE — The new concrete boat ramp at the Brady Interstate-80 Lake is closed due to underwater safety hazards. The ramp is located at the southeast corner of the lake and is blocked off by signs and posts. The boat ramp will reopen after repairs are made. Fishing will not be inhibited by the ramp closure. The lake is located southeast of the I-80 and Brady interchange. 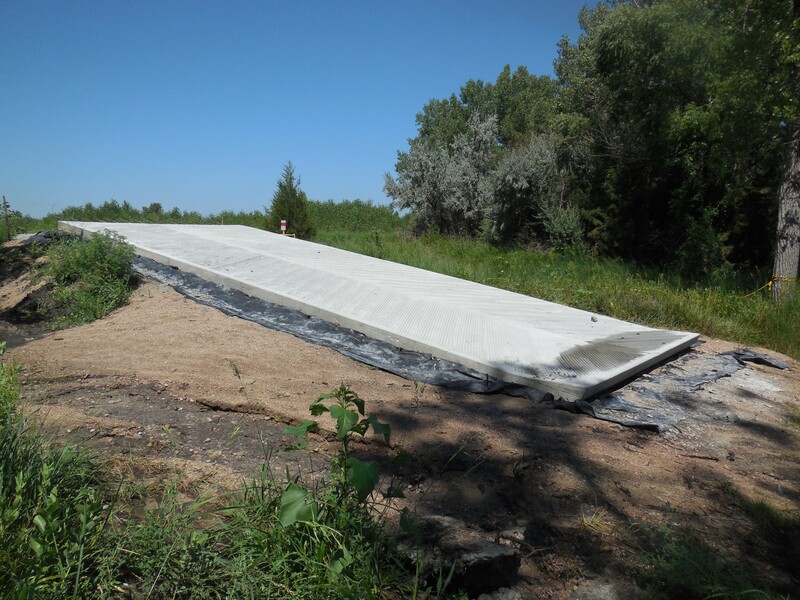 Concrete ramp at Hershey Interstate Lake prior to completion. A similar ramp is in place at Brady, but some work still needs to be done there. One change in fishing regulations for 2016 was that our Nebraska archery paddlefish season got moved up a month. The archery paddlefish season will now run during the month of June. From what I have heard from the archery paddlefish anglers, this should make it easier to fill their permits. However, with an earlier season, that also means we have an earlier application period. If you want to apply for an archery paddlefish permit, you need to be doing that N-O-W, NOW! LINCOLN – Applications for archery paddlefish permits will be received by the Nebraska Game and Parks Commission March 1-14. The application period begins at 1 p.m. Central Time on March 1. Mail applications must be received in the Commission’s Lincoln office by 5 p.m. and online applications must be received by 11:59 p.m. on March 14. Permits will be issued through a random drawing based on preference points earned, with the persons having earned the most preference points receiving the greatest priority. Any permits remaining following the drawing will be sold on a first-come, first-served basis beginning at 1 p.m. on May 2. A total of 275 permits have been authorized. The application fees are $22 for residents and $42 for nonresidents. To apply, visit a Commission office, OutdoorNebraska.org, or use a form in the 2016 Nebraska Fishing Guide. The 2016 archery paddlefish season is June 1-30. LINCOLN – The Nebraska Game and Parks Commission will certify youth fishing instructors March 12 at Ak-Sar-Ben Aquarium, 21502 W. Neb. Hwy. 31, Gretna, from 9 a.m. to 1 p.m. Youth fishing instructors will receive training and tools to conduct fishing clinics. These volunteers will have access to Nebraska Game and Parks’ loaner fishing equipment and educational materials for events, as well as receive program incentives. They also are encouraged to volunteer for such Nebraska Game and Parks programs as Family Fishing Nights and the Outdoor Expos. To reserve a spot in this free workshop, contact Larry Pape at larry.pape@nebraska.gov. That is all for now. There is a lot going on, and beside all of that we have open water and it is time, it is always time, to GO FISH!